Hey everyone. So I went a little different this time when painting my nails. Usually I pick a neutral or pink color, but this time I decided on something a little bit different. During my little shopping excursion in Plattsburgh last weekend I ended up buying a few nail polishes because they were on sale. One of them in particular was a bright orange called Orange Punch by Orly. This color is really bright and vibrant and I am really loving it! For going out of the box I am really loving this decision haha. Now we will have to see which crazy color I choose next! 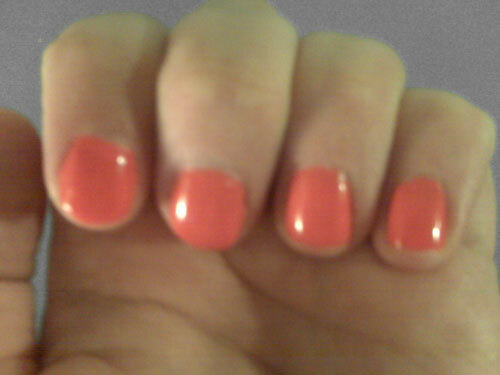 I tried to get as clear of a picture as I could..but somehow it looks more coral and pink than bright orange. I assure you that it is a really bright vibrant orange haha. I would almost even say it may be a neon color too! Also I was working on my collective haul post and somehow managed to delete all of my pictures which included the products and swatches! So now I have to retake them....not fun! I should hopefully have the haul done by the end of this week! I have quite a few mini hauls from Hautelook that I think I'll just combine into one for another haul. My favorite purchase so far is the new Deux Lux purse I bought! It's humongous and I think I can easily carry two puppies in it...it's that big! Anyways, I'll work on that and have it up soon with hopefully some pictures taken from my sister. She's been swamped lately with projects and assignments and I don't want to burden her by asking her to do mini photo shoots for me. So we'll wait until her semester is over for her to take pictures for me! Until then, I'm excited to go away this weekend and get these bad couples of days behind me! Going away with the girls for a bit of shopping, should be fun!